A book my 6 yr old loved, a little old for my preschoolers. A solid reading level 3 book, this reader has a good amount of advanced vocabulary words, but not so long that it discourages a new reader. Used it for his read out loud book, which was perfect. It took about 20 mins for him to read and had just enough new vocabulary words to make it challenging. Also, it was a fun and interesting story he could get into. He liked it so much, he asked for more by this author. Great reading book! This books was super cute & a good read. Enjoyed this with my 6 year old daughter. Looking foward to reading the rest of the series with her. This book would be good for kids just starting to get into chapter books. It has small chapters and only a couple sentences on each page making it a good transition book. I would not use this book to base any lesson off of though because it doesn't have any concept. Reviewed by Jennifer Wardrip aka "The Genius" for Kids @ TeensReadToo.comWhen the seasons change and fall comes around, it's time for Kate to go to school. Cocoa isn't too thrilled with the fact, as the four short, easy-to-read chapters of the book show. In MARY'S LAMB, Cocoa is determined to follow Kate and her school bus all the way to school, until he realizes that the faster she gets there, the quicker she'll return back home. With THE PORTRAIT, Cocoa helps Kate with her homework assignment, which involves painting a picture. A NEW FRIEND introduces Kate's schoolmate, Jenny, who Cocoa is determined not to like, until Kate reassures her best friend that nothing will ever take the place of her horse. In A REPORT, Kate and Cocoa both realize that Cocoa is the best one to help with a school report on horses! The COWGIRL KATE AND COCOA series is great for beginning readers, or for a quick and fun read before bed. This one is no exception, and the lessons learned in the story are ones that everyone can relate to. Includes two stories from the original Cowgirl Kate and Cocoa School Days collection. In "A New Friend," Cocoa the horse is jealous when Kate brings home a new pal, but Kate shows Cocoa that she will always love him best. In "A Report," Cocoa wants Kate to play with him, but she has to write a report for school. Good thing her report is on horses, so Cocoa can help her with it.Both of the stories deal with topics many students will encounter in their lives: friendship, jealousy, and balancing homework with play time. The equine-centric tales, with their colorful illustrations, will likely appeal to many horse lovers. Because this is a reprint, librarians and teachers may want to check their collections before adding this book, in order to avoid unintentional duplicates. As my daughter learned to read, I found these books as some early readers. I liked how Cowgirl Kate and her horse Cocoa interact. Cocoa is like a big puppy, or maybe more like a toddler. He pouts, complains, insists on his own way, etc.The language is 2nd reading level, so it is a good one to read to your 1st reading level children or to have your 2nd reading level children to read to you. I think that's what I like best about it. It is at a level that she can read on her own, and yet it is interesting and cute enough for her to enjoy it. It's fall for Cowgirl Kate and her horse Cocoa which means that Kate is off to school. Cocoa doesn't deal well with the changes school brings - Kate being gone during the day, making a new friend, and having homework - but soon he adjusts. Betsy Lewin in her watercolor illustrations gets the opportunity to give Kate some different clothes for the first time although the snazzy red cowboy boots from previous series entries still make an appearance. With each entry it becomes clearer that Cocoa is really the star of these stories with Kate as his straight man. Cowgirl Kate and her horse (and best friend), Cocoa, face the tribulations of separation, school assignments, and (gasp!) a new friend in this third outing of the early reader series. The very personified Cocoa (he gets jealous and likes to play tag) and his sometimes exasperated caretaker will entertain early chapter book readers with their antics and short dialogue. Betsy Lewin's ink and watercolor illustrations give the book an old-fashioned, timeless feel. It is Fall and time for Kate to head back to school, but Cocoa isn't thrilled about that. He busts out of his fence the day that Kate goes to school and chases it all the way to school. Kate tells Cocoa that others are making fun of him, calling him Mary's Little Lamb from the nursery rhyme. That's enough to make him run home! In this 4 short chapter book, we find Cocoa getting jealous of Kate's new friend and also Cocoa helping Kate out with a report! My daughter liked the book, because she could relate to it. She has been taking horse lessons for couple months and reading this book helped her remember good times she had with her horse Ginger and Hendrix. The third book in the series is as refreshing as the first two books. I love the consistency in the humor and brief chapters that move the story along so nicely. In School Days, Kate and Cocoa work through separation anxiety and jealousy. 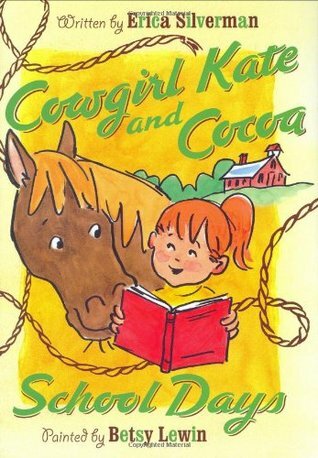 Another of the great Cowgirl Kate and Cocoa, (her talking horse), books. Boy, did Kinley like this book. Notes:Really like this series, but not as much as Mr. Putter and Tabby booksMy horse loving girl likes them a lot.Stories are a bit TOO simple.A few good laugh-out-loud moments in every book. I liked the horse Cocoa and the story. Book #3 in the series. More charming fun, more western action, and more life lessons learned the cowgirl way. Good, but not as good as the first book.